Welcome to the Nuclear Ship Savannah, the world's first nuclear-powered merchant ship. Savannah was a signature element of President Eisenhower's Atoms for Peace program. She was constructed as a joint project of the former Atomic Energy Commission (AEC) and the Maritime Administration. She operated from 1962 to 1965 in experimental service, at which time the AEC issued her commercial operating license number NS-1. Savannah continued in demonstration service as a cargo ship until 1970 when she ended her active career. She was defueled in 1971 and her reactor made permanently inoperable in 1975-76. About 95% of the power plant is intact and remains onboard ship. Savannah is still licensed by the Nuclear Regulatory Commission (NRC is the successor to the AEC), and will remain so until nuclear decommissioning. The defueling, active clean up work and natural decay over 30 years has left only small amounts of radioactive material aboard ship. This material is located in only a few, well monitored locations aboard ship. Savannah was nominated to the National Register of Historic Places in 1981. She was named a Mechanical Engineering Landmark by the American Society of Mechanical Engineers in 1983. She was named a Nuclear Engineering Landmark by the American Nuclear Society in 1991. And finally declared a National Historic Landmark by the U.S. National Park Service on July 17, 1991. Savannah is presently located in the Port of Baltimore, Maryland, under a long-term lay berth contract with Canton Marine Terminals. The U.S. Maritime Administration Savannah Technical Staff of the Office of Ship Disposal manages the activities onboard the ship, with strong emphasis on licensed facility operations and pre-decommissioning planning. The Maritime Administration intends to maintain Savannah in protective storage for some years into the future; however, under current law and regulation the decommissioning process must be completed and Savannah's operating license terminated no later than December 2031. In the normal course of NRC regulation decommissioning would include the complete dismantling of the reactor. 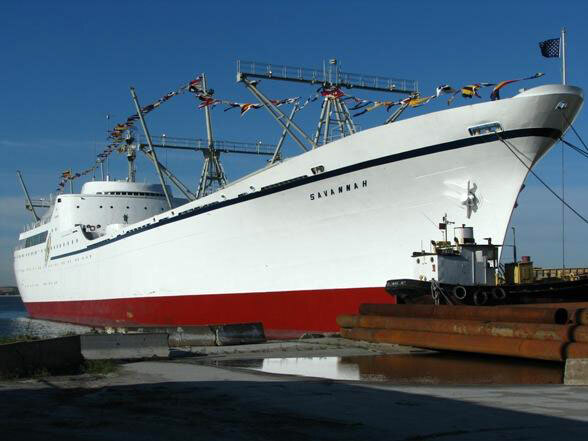 The historic ship community would like to see an exception made to allow for cleaning, then preservation of Savannah's historic nuclear reactor aboard ship. We hope this online tour will provide you with a glimpse of what life was like for the passengers and sailors aboard this remarkable vessel. It will also enable you visit many spaces that have never been opened to the public because of the vertical ladders, confined space and radiological controls. Although not open for visiting on a regular schedule at this time, the Savannah Technical Staff schedule periodic tours provided that these can be accommodated without interference to normal ship's business. For more information about touring the ship, please send an e-mail to: [email protected] and include "Tour Request" in the subject line. Galley, Another View, and Butcher Shop. Bridge, Radio Room, Emergency Generator, another view. Pre-commissioning (ca. 1959) Technical Press Information. Program Data and Charts 1962-1965. Solving problems viewing the panographic images.